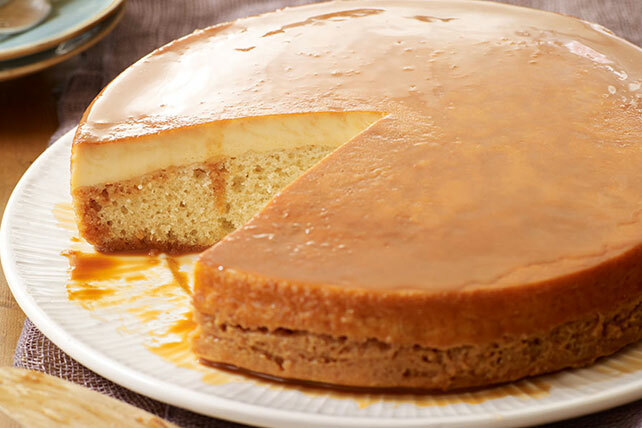 Try something new with this recipe for Vanilla Flan-Cake. Vanilla Flan-Cake is a variation of choco-flan that is all about the great taste of vanilla. Pour cajeta into 9-inch round cake pan sprayed with cooking spray. Blend milk, cream cheese, 3 eggs and 1/2 cup sugar in blender until smooth. Mix flour, baking powder and baking soda until blended. Beat butter and remaining sugar in large bowl with mixer until light and fluffy. Add remaining egg and vanilla; mix well. Beat in flour mixture alternately with sour cream. Pour over cajeta in pan. Carefully spoon cream cheese mixture over batter in pan; cover with foil sprayed with cooking spray, sprayed side down. Place filled cake pan in larger shallow pan. Add enough water to larger pan to come halfway up side of cake pan. Bake 1 hour 15 min. or until toothpick inserted in center of dessert comes out clean. Remove dessert from water bath; cool completely on wire rack. Refrigerate 2 hours. Unmold just before serving. Enjoy your favorite desserts on occasion but remember to keep tabs on portions. Run knife around rim of pan to loosen dessert. Place serving plate over cake pan. Invert cake onto plate. Gently remove cake pan; spoon any remaining caramel left in pan over dessert. Dessert can be stored in refrigerator up to 3 days before serving.